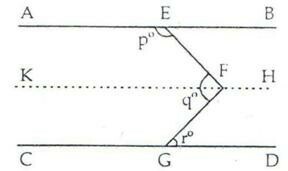 Angle: Two rays having a common end point form an angle. 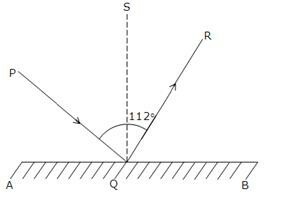 Interior of an angle: The interior of ∠AOB is the set of all points in its plane, which lie on the same side of OA as B and also on same side of OB as A.
Obtuse angle: An angle whose measure is more than 90° but less than 180°, is called an obtuse angle. 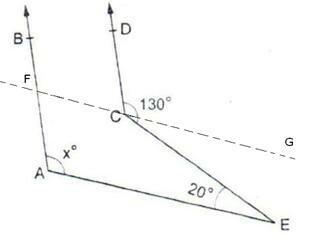 Reflex angle: An angle whose measure is more than 180° but less than 360° is called a reflex angle. 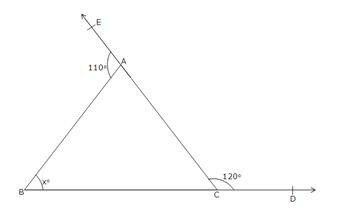 Complementary angles: Two angles are said to be complementary, if the sum of their measures is 90o. 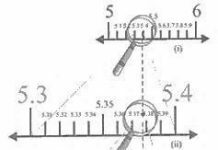 Supplementary angles: Two angles are said to be supplementary, if the sum of their measures is 180°. 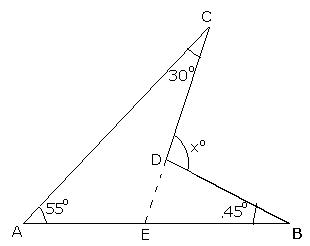 ∴ The measure of an angle which is equal to its complement is 45o. ∴ The measure of an angle which is equal to its supplement is 90o. ∴ The measure of an angle which is 36o more than its complement is 63o. 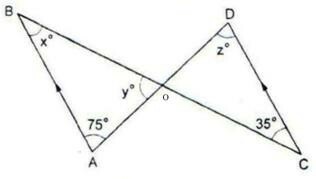 ∴ The required angle is 72o. 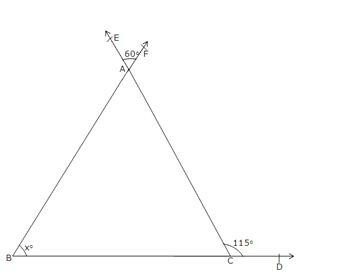 ∴ The required angle is 150o. 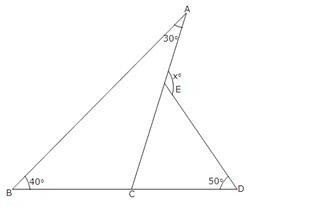 ∴ The required angle is 60o. 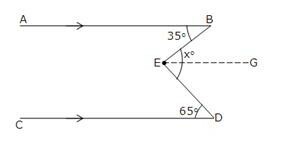 ∴ The required angle is 45o. Thus, the required angles are 108o and 180o – xo = 180 o – 108o = 72o. Thus, the required angles are 40o and 90o – xo = 90 o – 40o = 50o. 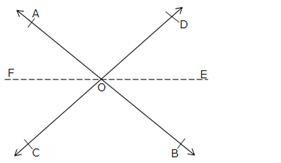 Let the required angle be xo. 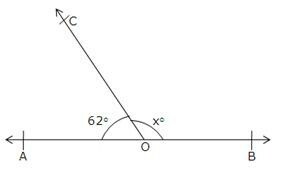 Then, its complementary and supplementary angles are (90o – x) and (180o – x) respectively. 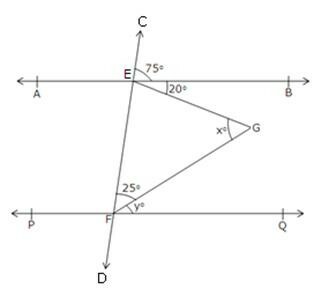 Thus, the required angle is 25o. Since, ∠BOD and ∠DOA form a linear pair. ∴ ∠AOC = (3 × 27.5 – 5)o = 82.5-5 = 77.5o And, ∠BOD = (x + 20)o = 27.5o + 20o = 47.5o. Since ∠BOD and ∠DOA from a linear pair of angles. ∴ x = 60, y = 48 and z = 72. 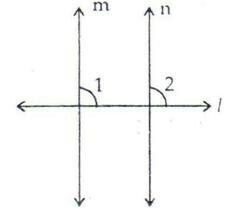 AOB will be a straight line, if two adjacent angles form a linear pair. 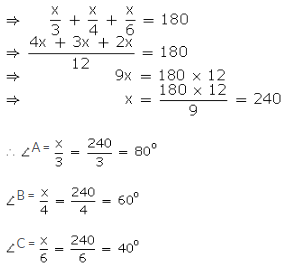 ∴ The value of x = 28. Since ∠AOC and ∠AOD form a linear pair. 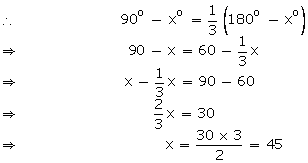 ∠AOD and ∠BOC are vertically opposite angles. 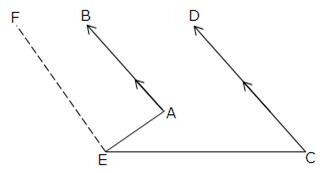 ∠BOD and ∠AOC are vertically opposite angles. 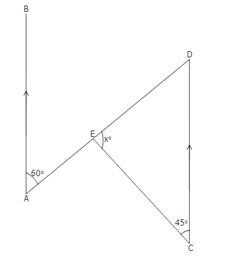 Since ∠COE and ∠EOD form a linear pair of angles. 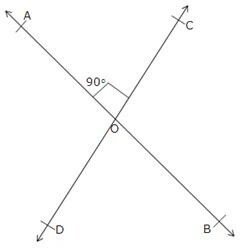 Let two straight lines AB and CD intersect at O and let ∠AOC = 90o. Also, as ∠AOC and ∠AOD form a linear pair. Thus, each of the remaining angles is 90o. 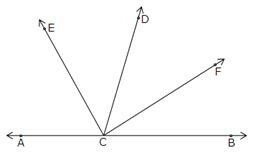 Since, ∠AOD and ∠BOC are vertically opposite angles. Since, ∠AOC and ∠BOD are vertically opposite angles. 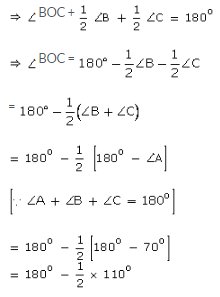 ∴ ∠BOC = 140o, ∠AOC = 40o , ∠AOD = 140o and ∠BOD = 40o. ∠BOD. OF is a ray opposite to ray OE. 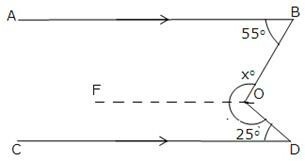 is a straight line passing through O. Proof: Since ∠ACD and ∠BCD forms a linear pair. ∴ ∠2 = 110o, ∠3 = 70o , ∠4 = 110o, ∠5 = 70o, ∠6 = 110o, ∠7 = 70o and ∠8 = 110o. Since ∠2 : ∠1 = 5 : 4. Let ∠2 and ∠1 be 5x and 4x respectively. Through E draw EG || CD. Now since EG||CD and ED is a transversal. EG||AB and EB is transversal. ⇒ ∠BEG + ∠GED = 35o + 65o = 100o. Now since OF || CD and OD is transversal. As OF || CD and AB || CD [Given] Thus, OF || AB and OB is a transversal. 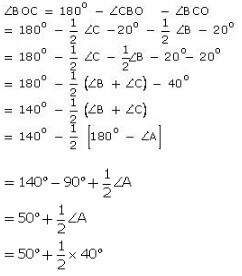 Now, xo = ∠FOB + ∠FOD = 125o + 155o = 280o. Through E, draw EF || CD. Now since EF || CD and EC is transversal. 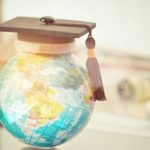 So, EF || AB and AE is a trasveral. 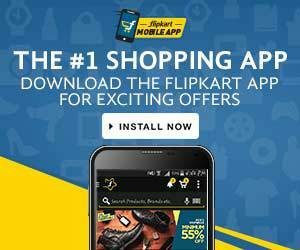 = 64o + 56o = 120o. Since AB || CD and BC is a transversal. Now, CD || EF and CE is transversal. Now, since CG || BE and CE is a transversal. Also, we have AB || CD and FG is a transversal. As, FG || AE, AF is a transversal. So, EF || CD and EC is a transversal. As BC || ED and CD is a transversal. ∴ xo = ∠ABC = 105o Hence, x = 105. Now, KF || CD and FG is a transversal. Again AE || KF, and EF is a transversal. Since AB || PQ and EF is a transversal. Since AB || CD and AC is a transversal. Since AB || CD and PQ a transversal. ∴ x = 35, y = 70 and z = 75. Also, AB || CD and PR is a transversal. ∴ x = 105, y = 75 and z = 50. AB || CD and PR is a transversal. 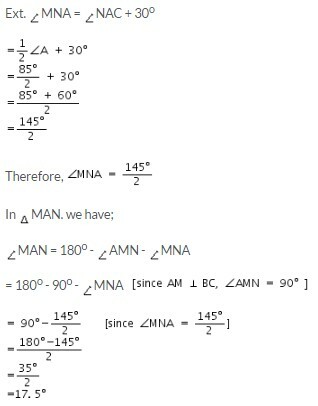 Given: Two lines m and n are perpendicular to a given line l.
But ∠1 and ∠2 are the corresponding angles made by the transversal l with lines m and n and they are proved to be equal. ∴ ∠A = 50o, ∠B = 58o and ∠C = 72o. ∴ ∠A = 58o, ∠B = 67o and ∠C = 55o. ∴ ∠P = 95o, ∠Q = 53o and ∠R = 32o. ∴ ∠A = 70o, ∠B = 46o and ∠C = 64o. Thus, the required angles of the triangle are 54o, 54o and xo + 18o = 54o + 18o = 72o. 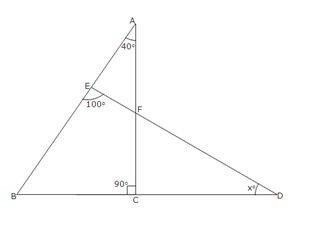 ∴ The required angles of the triangle are 60o, 90o, 30o. 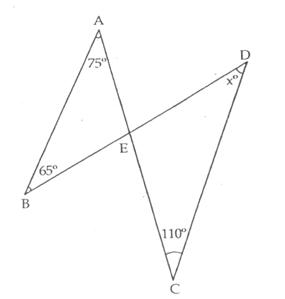 ∴ The required angles are 53o, 37o and 90o. So, we find that ABC is a right triangle, right angled at C.
∆ABC is an acute angled triangle. i.e., ∠B > 90o which means ∠B is an obtuse angle. ∆ABC is an obtuse angled triangle. ∴ ∠ACB = 52o and ∠BAC = 85o. Produce CD to cut AB at E.
⇒ ∠A + ∠B + ∠C + ∠D + ∠E + ∠F = 360o. We have a ∆ABC whose sides AB and AC have been procued to D and E. A = 40o and bisectors of ∠CBD and ∠BCE meet at O. (i) False (ii) True (iii) False (iv) False (v) True (vi) True.